Jordan asks if she’s talked to Zach today. Jordan – we got a good group we’ll roll with that for awhile.. the good thing about us we’re two votes and if we need to flip flop alliances we can do it. Jordan – Kev’s speech seems to have deterred him from blowing up on everybody.. which is great. Sarah points out her, Brittnee and Johnny are in trouble if the guys win HOH. Willow calls herself a floater. They mention about have the votes to get Graig out this week but both of them want Bobby out next week. They count the votes, kevin, Pilar, Willow, Sarah and Johnny are locked to evict Graig. This week they need 6 votes to evict or 5 votes to bring it to ta tie. They know Brittnee wants Graig gone. AShleigh says she will nominated Godfrey and Johnny. Willow says she will do the same thing maybe nominate Kevin (as the pawn). Willow joins the rest of the houseguests in the living room. Bruno and Godfrey join them. Bruno to Godfrey “your mic’s in the water bud” Chit chat. 11:20pm Zach and AShleigh talking about her see threw pants. They mention Willow got a strike. Talk moves to how many times production gets mad at them for talking about production. bobby says he’s never been caught because he never talks about it. They agree Jordan is caught the most. Godfrey thinks he’ll get kicked out for taking too many naps. Graig – For the Show bro.. I’ll go after them.. I’ll go after them hard. 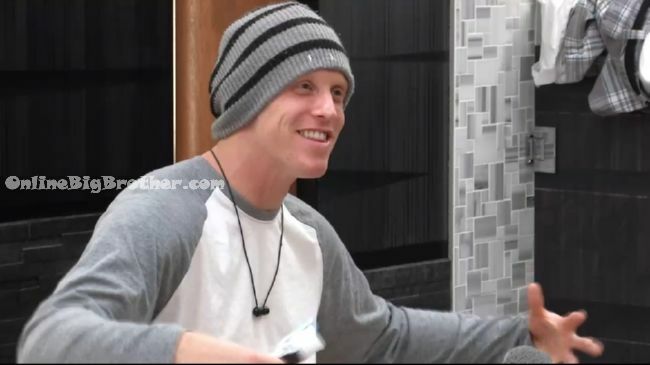 kevin – bobby is much more like..
Graig – YAAA .. for the F***g show.. you know what I mean..
kevin says he’s going to talk to Zach. Graig says Jordan, Bruno and Godfrey are locked votes. He adds the vote is either going to be a blow out or he’s in. Graig trying to get Godfrey to help him get the votes. Graig tells him to work on Zach he’s the one they are unsure about. Jordan is one horny disgusting little perv. He was always touching up on Sindy when she gave him attention and now that horndog is always looking opportunity to touch Willow. While a part of me wants to see Graig stay (for entertainment reasons), he is going to over campaign………. like Sindy from last week. Either way, I do not care who leaves this week. It is funny how the DR is trying to make Zach and Ashleigh happen, when it is nothing more than a mild flirtation from the feeds. It seems like either way, the Chop Shop is ending, since everyone wants Bobby/Bruno gone next week. Since the feeds have been back every night I see them cuddling, kissing, hands down pants etc.. unfortunately the audio is always out so we can’t hear what they talk about. Why would Willow say she’d nominate Kevin in front of Pilar?…She’d not very smart is she? AND in desperate need of a dictionary. I, for one, am totally “Bro” and “F (anything)” ‘d out! Grain has got be one of the most delusional person in this house, no one likes you and for the sake of Canada please shut up! Please just leave Graig. Your personality is 100% awful. Wouldn’t it be more beneficial to get rid of Bobby, considering he is a bigger threat? But at the same time i know the HG’s don’t know this, but it would be better to get rid of Graig especially since one of the 1st 5 HG’s will be coming back, so Bobby is a bigger threat to win a comp to get back in instead of Graig so that might be a better choice in the long run. I have to admit I really enjoy watching Graeg squirm… He’s doing everything wrong (too much campaigning/begging, too soon; talk to Zach and JP when there are several other people in the room, …). Don’t get me wrong, I can’t stand him. But he’s such a trainwreck. I love how he tells everybody that “evicting him” would be the big move compared to evicting Bobby, who’s so much stronger physically and socially. This guy is just delusional. Why would they rather get Graig out, if Bobby is a bigger threat in terms of competitions. So Johnny won POV and saved Kevin, and then Bobby got put up? So Bobby or Graig will go home. I personally think they should vote Bobby, only because I think he could win more then Graig. But Graig does have Bruno, so either way good choice that Brittnee nominated them. The females were dropping like flies, its about time a guy leaves. She has so much potential and I don’t want that lost. Not even as a good player but as an entertaining one. Pilar is so sweet but watching her flirtation with Kevin, it seems exhausting talking to her. Ofc I’d be the same if I wasn’t speaking my first language. Craig got BACKDOORED by Britnee. Kevin and Bobby were initial nominees, Johnny won PoV and took Kevin off. I’m impressed! I’m really trying to figure out the casting people’s though process. In what world did they think Pilar was a good choice? At least Victoria was emotional and semi-entertaining. Pilar either laughs, makes out with Kevin, or does both. Did he seem curious about something being down there? Or was he just playing? I hope Canada gets to vote again this year to put two people on the block. I would vote JP and Zach in a heartbeat. I don’t like how cocky these two are. The discussions they have with one another about how stupid everyone else is make me want to puke. If they think they are going to get away with this for much longer, they are sadly mistaken. Surely someone is going to go after the two of them soon…..sooner than later I hope. If you’re so sure “someone” is going to target them soon anyway, why do you want a Canada HOH twist to put them up? I’m confused at BB fans who develop a strong dislike for the HGs who are obviously the better BB players, just because they’re doing such a good job at the game. Would you rather have a season of Pilars and Graegs? Them talking about how stupid Graeg is is completely normal, since Graeg really is VERY stupid. Them acting cocky, saying “we’ve got this!” is a subconscious way to create a bond, to make the other guy trust you more, to make him feel that sticking with you will be the better, more enjoyable experience. As seen in every season of BB, ever. Ignore what I said about Zach and Ashleigh above. They have been making out in the Have Not room for about 20 minutes. Production has FINALLY got the footage they need for this showmance to blossom on TV (other than their DRs about it for the past 6 episodes). I want Bobby to wake up, cockblock, and go Beast Mode on them. bobby or graig… who is it smarter to evict? bobby is more of a known threat, graig is more of a known annoyance. depends on how noms and replacement nom were worded I guess. is Zach being overconfident in his belief that he controls Ashleigh? not that Zach would know, but doesn’t ash have a final two with bobby? or did that vanish when bobby put his tongue in Ashleigh’s brainstem? could not care less about the promance of Zach and Ashleigh (brought to you courtesy of production and kfc). take note: pilar talked game for the first time we’ve seen on feeds tonight. most of that was ‘oh no don’t say kevin, no, someone else’ but she talked game. sure they are getting closer to the hidden power in the floor. with Zach present. if he gets the floor power it’s going to take everyone on here to convince me it isn’t ultimate production bullcrap. okay. i’m coming down from my feed induced hyper-euphoria.